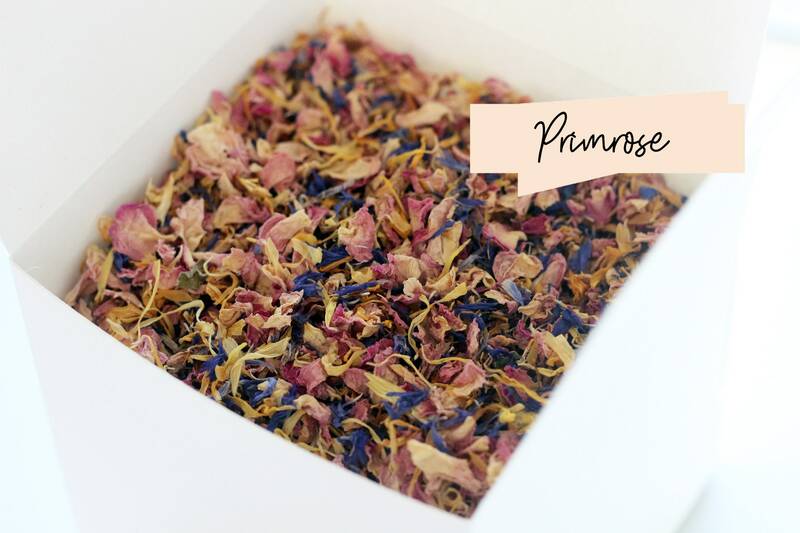 A colourful, pretty mix of pink, blue and marigold petals. Single portion 1/3 cup, equivalent to fill an A5 paper cone or small pouch. STANDARD ORDER will ship as quickly as possible, if you need your confetti urgently please upgrade to express. RUSH ORDER your confetti, please get in touch before selecting express shipping to ensure your preferences are available. Select 'EXPRESS' for shipping upon checkout. PRE-ORDER your confetti for your upcoming nuptials! Please include your ceremony date in your order notes. Expect shipment 2 - 4 weeks before your supplied ceremony date. SHIPPING POLICY expect shipment 2 -4 weeks before your supplied ceremony date. For further detail please refer to my policy page. Can I PRE-ORDER my confetti? You can place your order up to 12 months in advance. Please place your ceremony date into your order notes or into the personalisation field upon purchase. Your order will then be scheduled in for dispatch 2 - 4 weeks before your provided ceremony date. This is to ensure petals are in top condition for use. Please be assured I keep a close eye on the dispatch of all orders, and if there is ever any concern about timeframes I will upgrade your order to express if necessary. Turn around time varies depending on what you are ordering. I can generally get your order to you within 4 business days, depending on your location. Express shipping is available and should arrive to Australia Post selected metro destinations within 2 days of ordering. Please get in touch before you order to ensure that your preferred items are available within that timeframe. Overnight service may be available, but please get in touch before you place an order. HOW MUCH confetti do we need? Most people cater to at least half their guests. Depending on the confetti shower effect you want, you may want to supply enough for every guest to take part in the fun! If you are considering bulk boxes, a single portion is 1-2 handfuls, depending on your handful size! Shipment of your order depends entirely upon your preference. My standard service is prompt shipment unless you request 'Pre-order' upon checkout OR place your ceremony date into your order notes. If you are pre-ordering dispatch is around 2 - 4 weeks before your supplied ceremony date. Express orders are shipped as quickly as possible. Please get in touch before you place a rush order to ensure your preferences are readily available for shipment. Express International orders take longer, please keep in mind orders outside of Australia need a minimum of five business days to get through production and overseas. Please take this information as a guide, just get in touch if you have a specific question.